MONTREAL – The outcome of Quebec’s April 7 election “will be the defining influence” on Montreal’s real estate market until 2015, with consumer confidence currently dampened by “political uncertainty,” Sotheby’s International Realty Canada said. In an outlook to be released Tuesday, Sotheby’s said Montreal buyers heading into the spring market are likely to put off their purchases until a new provincial government is chosen. Their reticence is linked to recent speculation that a Parti Québécois victory could lead to another referendum on sovereignty, Sotheby’s Canada CEO Ross McCredie said. “People, when they’re making major decisions like purchasing a home — if there’s uncertainty in the market as to what would happen — they hold off,” McCredie said in an interview. “What they (Sotheby’s brokers) are seeing is that a lot of people are waiting to see what happens with the election. If the PQ does get in, you probably face a referendum at some point. The Sotheby’s housing and economic outlook for spring 2014 describes broader market trends for Toronto, Montreal, Calgary and Vancouver — the four major urban markets that drive the majority of the real estate values in Canada, he said. Nationally, Sotheby’s “anticipates a spring market with few signs of stress in the months ahead. The report was based on interviews with Sotheby’s real estate brokers and macroeconomic indicators such as foreign exchange and the U.S. recovery, along with data from real estate boards. Buyers generally have the upper hand in Greater Montreal, where resales decreased two per cent in February, year over year. During that same period, the median price of a single-family home grew two per cent to reach $275,000. 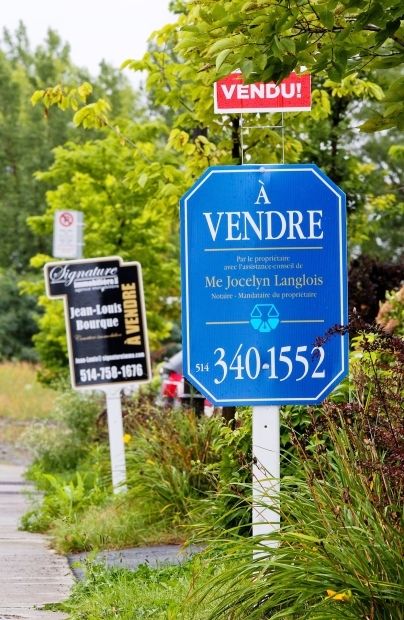 The Greater Montreal Real Estate Board declined to comment on the market commentary published by Sotheby’s. On Monday, the Canadian Real Estate Association forecast sales would grow 1.3 per cent nationally, with the average price of a home rising 3.8 per cent to $397,000 this year, compared with 2013. Other factors that could boost Montreal spring sales include the weaker loonie driving more interest from foreign buyers, while bolstering Quebec exports. What’s more, Montreal reported the second-highest immigration numbers in the country between July 1, 2012, and June 30, 2013, with 46,217 international immigrants entering the city, driving demand for housing, the outlook said. “The election is out there as a major issue, but it’s one of five or six major issues for us,” McCredie said. Election-related uncertainty is not unique to Quebec, McCredie said. Resales in British Columbia also slowed last year before the provincial election, as voters weighed the impact of an NDP or Liberal government on the economy, he said. “A lot of people held off. But once the Liberals got back in, literally within a month, we saw major purchases start to happen, at all price points,” he said. “Once that decision is made and the election goes through then people start to make the decision if they want to buy or if they want to sell.